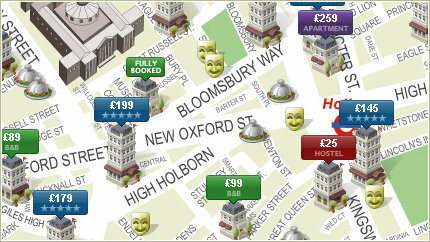 Find the perfect hotel as you move effortlessly around the full screen London hotel map on LondonTown.com. Hotels plotted on the map connect directly to each hotel's reservation systems to ensure accurate rates and availability. When and where are you staying? Along with hotel information, you can also make your hotel selection by viewing local entertainment and exhibition venues with, once again, live availability and ticket prices for events at those venues. Want to find a great restaurant near your hotel? The LondonTown.com hotel map shows you the location of all the best places in the area to eat and drink. Unlike a guidebook, the LondonTown.com hotel map displays all events that will be on during your stay, from fine art and theatre to live music and clubbing. that consistently lives up to or exceeds expectation.